Boost the "sunshine vitamin" for healthy bones and beyond. Vitamin D, affectionately known as the “sunshine vitamin,” is not actually a vitamin at all. It is what’s known as a “pro-hormone”—it can be manufactured by the body and, in addition to being a critical factor for bone health, it is involved in cell growth, immune function, and fighting inflammation, just to name a few of its roles. Vitamin D-efense. While vitamin D is most often thought of in connection with building bones, it has been the focus of countless studies on other roles, such as fighting diabetes, cognitive decline, cancer, multiple sclerosis, and psychosis; and even acting as a probiotic in the intestinal tract. Recently a study in the Journal of Endocrinology suggested vitamin D may help manage pain. While several studies have found that higher intakes and blood levels of vitamin D are linked to a lower risk of disease, we don’t know for sure if taking more vitamin D actually prevents disease. 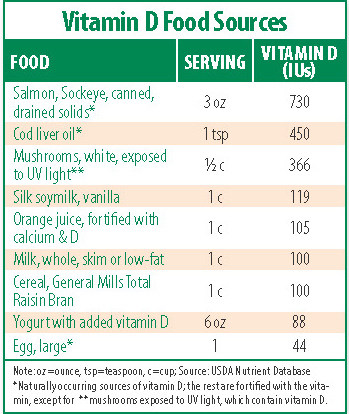 Vitamin D Sources. The body produces vitamin D when skin is exposed to the sun’s UV rays; exposure of bare skin for only 5–10 minutes, 2–3 times per week is enough for the body to produce enough vitamin D. But if sun exposure is infrequent or if sunscreen is used, stores can run low and, because few foods (fish and eggs) naturally contain vitamin D, a supplement may be necessary. Vitamin D is found as either vitamin D2 (ergocalciferol) or D3 (cholecalciferol) in foods and supplements. There is disagreement as to which is better, though a recent study published in BMC Endocrine Disorders found that D2 works best for raising blood levels if given daily, while D3 is best given twice a week. How Much is Enough? The Institute of Medicine recommends adequate vitamin D intake at levels that maintain bone health and normal calcium metabolism in healthy people, which does not take into account the possible roles of vitamin D in preventing or treating other health conditions. Current Recommended Dietary Intakes (RDIs) for vitamin D are 600 International Units (IUs) a day for adults up to age 70, and 800 IUs for adults above 70. However, some experts recommend 1,000 IUs a day to reduce the risk of disease. How much you need is complicated by skin color (darker skin reduces the skin’s ability to produce vitamin D), age (bioavailability declines with age), conditions that interfere with absorption (i.e., inflammatory bowel disease or previous gastric bypass surgery), and medications (some seizure medications, steroids, calcium channel blockers, and some cholesterol-lowering drugs can interfere with absorption). Tags bone, bone health, bowel disease, calcium, calcium channel blockers, cancer, cholesterol, cholesterol lowering, cholesterol lowering drugs, cognitive decline, diabetes, health, hormone, inflammation, inflammatory bowel, inflammatory bowel disease, institute of medicine, manage pain, metabolism, multiple sclerosis, pain, seizure, skin, sunshine vitamin, supplement, supplements, the sunshine vitamin, vitamin, vitamin d.